Growing up, you loved ‘em. From popsicles to sugary breakfast cereals, some foods are just for kids. Check out the local bars and restaurants putting an adult twist on these back-in-the-day favorites. The evolution of these dishes will please grown-ups with a blast from the past. San Diegans both young and old delight with these interpretations of childhood favorites. Pacific Beach’s go-to spot for farm-fresh, country style breakfast is taking a classic cereal to a whole other level. TruckStop, where traditional breakfast items are served daily, is family-friendly and within steps of the shoreline. You can’t go wrong with this local eatery. 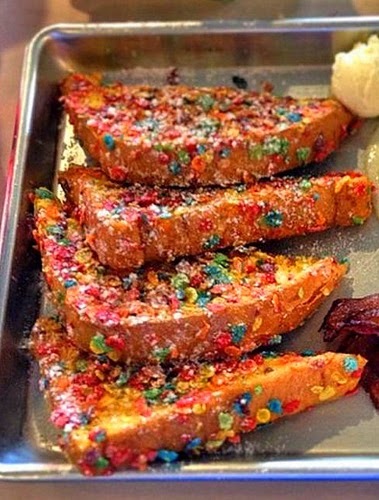 TruckStop’s Fruity Pebbles American Toast is the perfect presentation for the child in all of us. American Toast is like French Toast, but better. Try the one- inch thick sliced brioche, hand-dipped in egg and rolled in classic Fruity Pebbles. Is your stomach growling yet? Snack food is key for kids and adults and the pretzel goes primetime thanks to the pastry chef. Tavern, a coastal-cool bar and restaurant located in Pacific Beach, features top quality local ingredients and celebrates the hearty flavor of pretzels. Paying homage to the classics with a new twist, the 3 Little Pigsbreakfast has sausages wrapped in soft pretzels and served with maple syrup and potato plank hash. 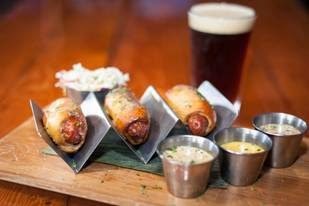 Try the Kegs in a Blanket for lunch. The pretzel-wrapped cheddar-beer brats with house-crafted mustards, green papaya and jicama sauce don’t disappoint. These grown-up pigs in a blanket, pretzel style, will have you planning your next trip back to order more. We all remember tater tots; crispy on the outside, soft on the inside and wonderfully delicious. One local restaurant has taken tots out of the lunchroom and put ‘em smack in the middle of the dinner table. 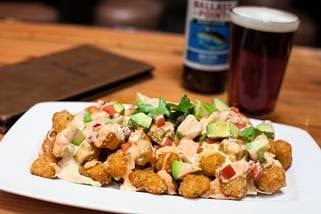 True North Tavern in North Park features tater tots that are all grown up. FromLoaded Tots, to their classic Basket of Tots, and six other options in between, you won’t be disappointed with their selection. The Street Corn Named Desire tots include carne asada, grilled corn, peppers, onions, salsa fresco, chipotle crema and ranchero sauce. What was once an after-school snack evolved into an after-hours, must-have for a case of the munchies. Located off Mission Boulevard in Pacific Beach, The Duck Dive, is serving up Gastro-pub inspired cuisine in a casual beach lounge atmosphere. Their Corn Dog Bites are little bite-size pieces of heaven. Gouda filled and with duroc pork sausages, this delicious appetizer is served with house-made mustard and ketchup. Popsicles aren’t just for kids, and this high-energy restaurant and bar proves it. Located in San Diego’s Gaslamp District, barleymash is taking the classic summer treat to a whole other level with this rotating addition to the menu. The Moonshine Mule Popsicle is a blend of classic moonshine, ginger beer and fresh lime juice. 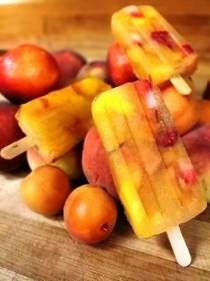 We also love the White Peach Sangria Popsicle, with white wine, light rum, orange juice, fresh fruit and peach and agave nectar. Grab these frozen delights and enjoy summer like a kid again. One exotic neighborhood dining destination knows nostalgia. With two prime locations, one in Hillcrest and the other downtown, Lotus Thai offers a variety of authentic Thai dishes surrounded by an inviting and eclectic atmosphere. Their Thai Corn Fritters are more than just the crispy cakes mom used to make. Fresh corn kernels fried and spiced with peppercorn and garlic, these delicious crunchy snacks are served with sweet plum cucumber sauce for dipping. The crispy and sugary flavors combined create a blast from the past that you won’t want to pass up.